A reliable source for Jet Dust Collectors information and a resource for accessing leading Jet Dust Collectors and suppliers. Jet Dust Collectors Jet dust collectors, also called pulse-jet dust collectors or reverse-jet dust collectors, minimize air particle contamination in workshops, plants and manufacturing facilities using short bursts of compressed air. Jet dust collectors offer continuous operation and cleaning without interrupting the air flow because the short burst of air is so minor compared to the total volume of contaminated air in the device. Jet dust collectors are one of the most widely used types of dust collecting systems because they require little maintenance, can clean high density dust and offer excellent filter efficiency. However, jet dust collectors take up more space than most other types of dust collectors, often requiring outdoor installation. Industries that benefit from jet dust collectors include pharmaceutical, cement, iron and steel, petrochemical, agricultural, food processing, automotive and mining. 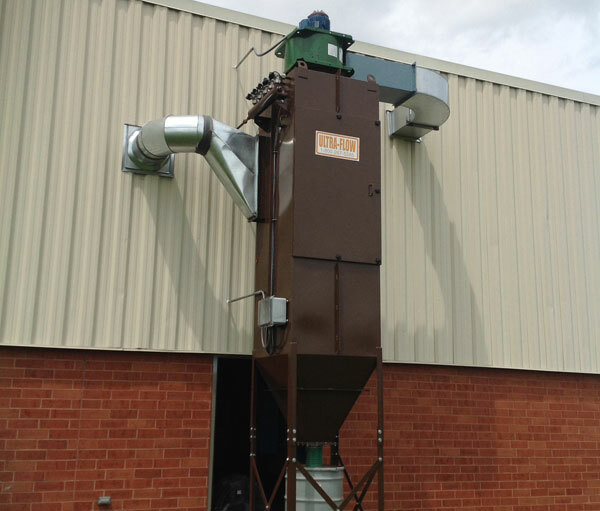 Ideal applications for jet dust collectors include product recovery, dust capturing, separating and filtering explosive media, metalworking chips, toxic media, central vacuum cleaning and pneumatic conveying. A type of baghouse, jet dust collectors utilize fabric filters, or bags, to capture contaminated gas particulates and release clean air back into the workplace. In jet dust collection, the bags lined up in a row and are supported by a metal cage, which is fastened onto a cell plate, also called a tube sheet, at the top of the jet dust collector. As contaminated air enters the jet dust collector, it flows from the outside to the inside of the bags. The metal cage ensures that the bags do not collapse from the additional weight. The bags are then cleaned by short bursts of compressed air that are controlled by a timer control board that utilizes a solenoid valve enclosure and a diaphragm valve on the outside of the filter housing. The compressed air is then injected through a compressed air manifold that is mounted at the top of the jet dust collector over the row of bags. The compressed air is then accelerated due to venturi nozzles, nozzles that reduce fluid pressure resulting from fluid flowing through a constricted section of pipe, that are mounted over the top of each bag. About 0.01 seconds, the burst of compressed air is so short that it acts as a rapid-motion air bubble, traveling through the entirety of the bag and causing the bag surfaces to flex. When the bag surfaces flex, the bag breaks the dust cake and the dislocated dirt falls into the storage hopper down below. 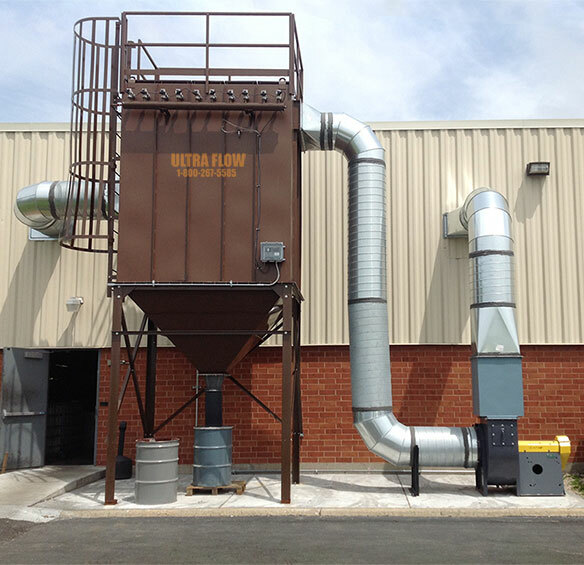 The clean air then rises and exits out of an exhaust output at the top of the jet dust collector.